The past couple of weeks brought some fun blogging-related events for me to attend! One of the things that I love the most about going to college in the South/Charlotte is that the blogging community here is so vibrant and full of life. There always seem to be events going on! My school schedule normally prevents me from attending many of the events that I'm invited to, but October was finally a month that I was able to socialize with some blogger babes! 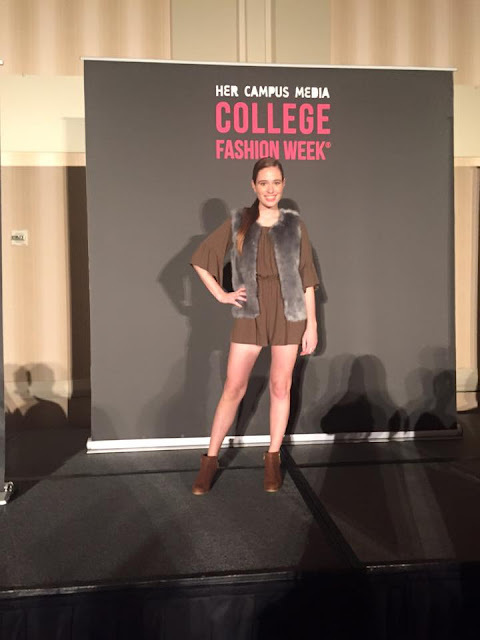 A couple weekends ago, I traveled to Atlanta to participate in Her Campus College Fashion Week! Her Campus extended the invitation for bloggers in the Her Campus Blogger Network to be models in the four College Fashion Week shows this season. I applied to be in the Atlanta show, and was so excited when I got chosen! The other models were other bloggers, as well as nearby college students who were either involved in their colleges chapters of Her Campus, or had an interest in fashion and design. Excuse the poor quality iPhone photos from the event, but hopefully you can still get a just of the event. It was held at the Hilton in Downtown Atlanta, which was a huge hotel! The outfit that I wore in the show was from Topshop- the romper was so fun!! And the vest I wore was so super soft. And then last Wednesday, I had the pleasure of being in the co-host role for the first time for a blogging event! Myself, my Charlotte blog bestie Morgan from How 2 Wear It, and two other Charlotte fashion bloggers (Laura from Louella Reese and Taylor from Style Souffle), all enjoyed hosting a fun fall shopping event at SouthPark Mall's Kendra Scott store! I had such a wonderful evening checking out all of the new Kendra Scott items (and some classic styles, which is what I ended up taking home!) and socializing with my school friends and blog friends! I hope this is certainly not the last event that I will host or co-host. 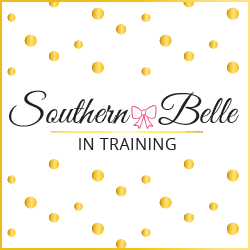 Have you been to any blogging events lately? I am hoping to get together with some Charlotte bloggers again before I go home for the holidays next month! And I would love to attend a blogging conference in 2016 or 2017- that's on my blogging bucket list for sure. We had so much fun at that event and I hope we can host together again in the future! I feel like the majority of the bloggers in my area are older than me so I haven't gone to any events for that reason. I do want to attend a blogging conference in the future as well. That must have been fun for you! 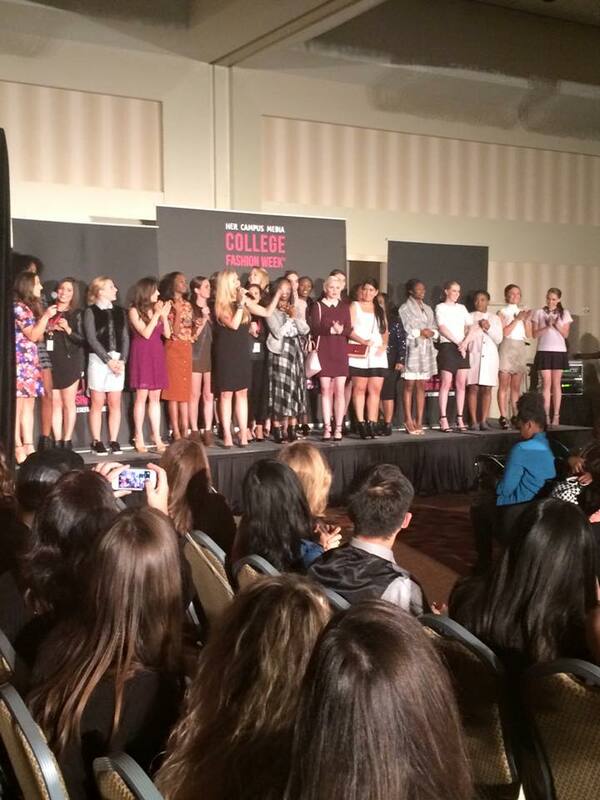 Congrats on being part of the fashion show! I saw pics, and I was so excited for you! It looks and sounds like it was so fun. I'm so jealous of all of the blogger meetups you've had! I want to go to blogger events, but there's nothing around me. I'm traveling to NC for Christmas though, so maybe I'll be able to join in on some fun stuff too while I'm there! Looks like so many fun, different events you were able to attend! So jealous! What a fun event! Living so far from a big town has made attending blogging events difficult! I hope to attend more in the future as it is such a good networking tool! Oh my gosh, this totally makes me wish blogging events happen in my hometown! It looks like you had a great time with Kendra Scott! There is a new store opening where I'm from and I can't wait! Looks like a fun few events! I usually can't attend events either because of school. :( It's the worst! How fun! I've never gone to a blogging event before! OMG How cool! I totally wanted to go to y'alls Kendra Scott party...but I live in TN! It looks amazing and I hope you had so much fun!